In this video, you will learn how to make the sprite talk about the prompt you selected. 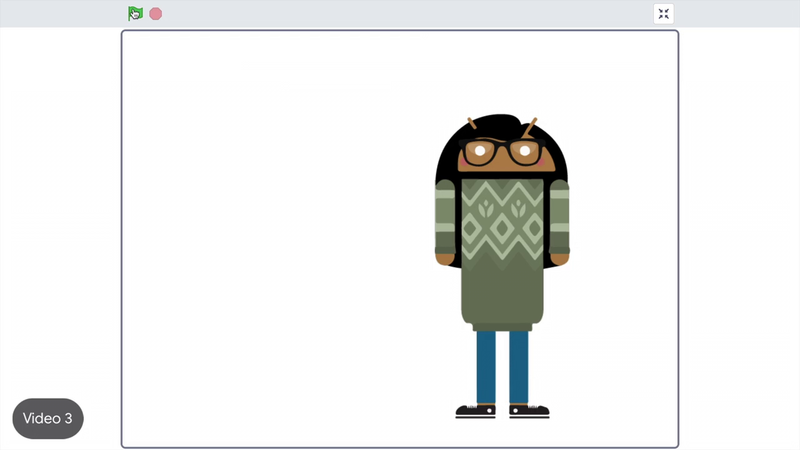 To make the android talk or move, add code to the scripts editor for the android sprite. Click on the android in the looks menu. Drag out a say for two seconds block. Click inside the white space in the say for two seconds block. The text hello automatically highlights. Think about the story prompt you chose and type in a sentence that starts to answer that question. This example start with the game character most like me is Yoshi. Write a sentence that makes sense for the prompt you selected. Drag out another say for two seconds block and move it under the first block until it snaps into place. Change the text in the second block to the next sentence for your story. Click the entire stack of blocks to try it out in your program. Great, the android says the text in the first block then says the text in the second block. Computer scientists, like you, test their code often as they build it so they can find and fix unexpected behaviors as soon as possible. Try your code often as you build. Add more say blocks to the stack to tell your full story. When you have a story you like, make it easy for users of your program to start your story when they click the flag. Click the events menu and drag a when flag clicked block to the top of the stack. Now, the user can start your program by clicking the green flag at the top of your project. The story begins when the flag is clicked. Explore the other blocks in scratch to add more to your story. Use motion blocks like glide and move to make your android take action. Try sound blocks and forever loops to create a music track for your program. You can always click on a block to try it out before you use it in your program. So don't be afraid to explore and use your imagination. Add at least three say blocks that respond to the prompt you selected. Add text to the blocks to tell your own story. Add a when flag clicked block to the top of the stack to make it easy to start your program. Before moving on to the add-ons, take a moment to make sure you are signed in to the CS First website. If you are not signed in, you won't receive a digital badge or completing this activity so be sure to sign in. Add at least 3 "say" blocks that respond to the prompt you selected. Add text to the blocks to tell your own story. Add a "when flag clicked" block to the top of the stack to make it easy to start your program.